My wrist fracture from a few months ago is still bothersome, but nothing some Voltarin Creme, Tylenol and anti-inflammatory pills won’t handle. Taking a wrist brace just in case. As with all these adventures, it’s been a case of refining the kit down to the minimal for the ride. I’m using my trusty Motobecane titanium hard tail with carbon forks. 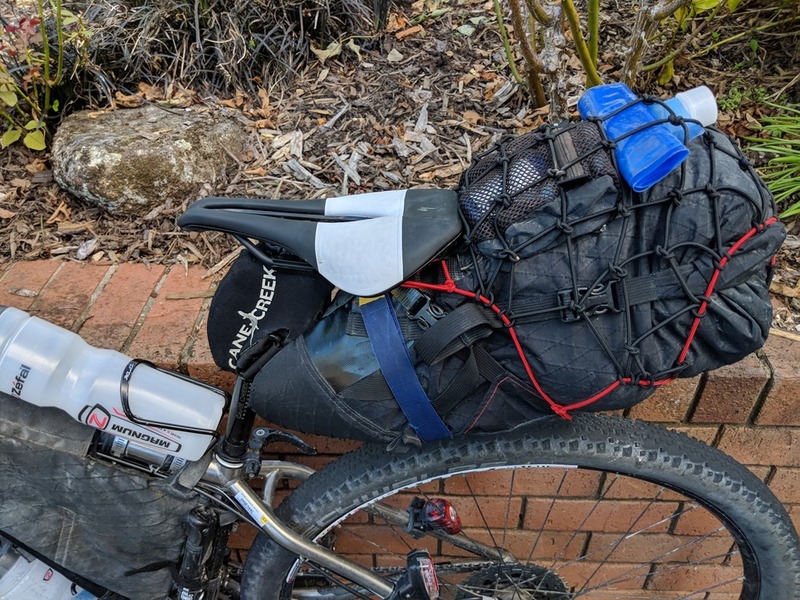 Just over 22 kg with all the gear. I was out for a ride today and someone grabbed this photo. Bags are Revelate Design seat, frame, harness and harness bag. I’ve a Topeak gas tank bag. I’ve a SON front dynamo for powering a Sinewave Beacon light, which also has USB output for charging the Garmin 1000, cell phone etc. I’ve a Lupine Pico R light as a backup, with a 6600 mAh battery. This also serves as a USB backup power should the dynamo fail. I’ve a second 2500 mAh backup in the OT Buckshot Pro Bluetooth speaker which keeps me entertained. I’ve a B&M dynamo rear light, as well as a Night Rider Solas USB. Why have the duplicates? 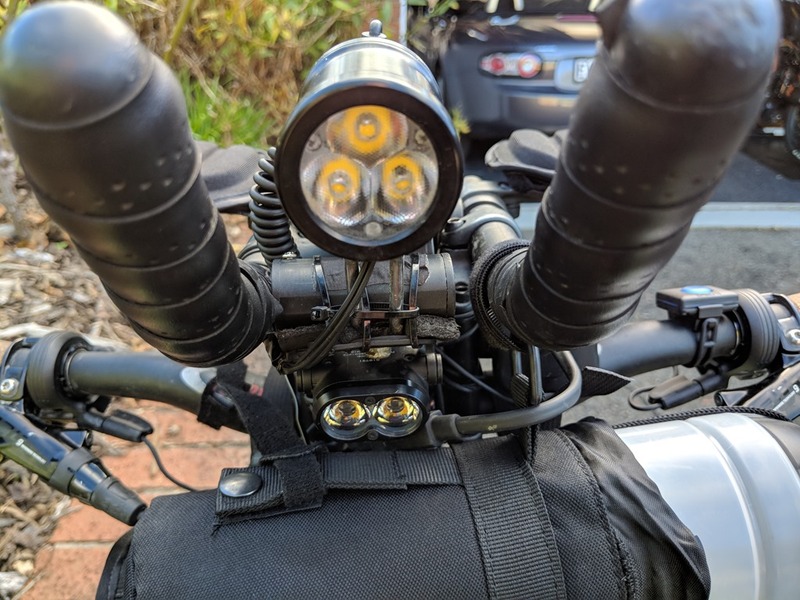 After my B&M Luxos light failed in the first day of the Indian Pacific Wheelrace I don’t want to go through that experience ever again! Here are photos of the cockpit. The Sinewave is on top; the Lupine beneath it. The 6600 mAh battery can be seen under the left aero bars. Below left is a view of the cockpit from the back, showing the Garmin 1000 and the Di2 control box. Why Di2? Fractured wrist has made me concerned so I did a retrofit over Christmas. It’s definitely an indulgence and I like the ease of shifting. I’m getting old. Around my seat bag is a flexible mesh which was made for me by ex-Tour Divider Charlie Kemp. They are great as they allow you to stuff in your vest/jacket or anything that you want. On the top is the Revelate Sprocket mesh bag with my SPOT GPS and some other stuff. Next to it is a rolled up 1 litre water bottle which is my spare. 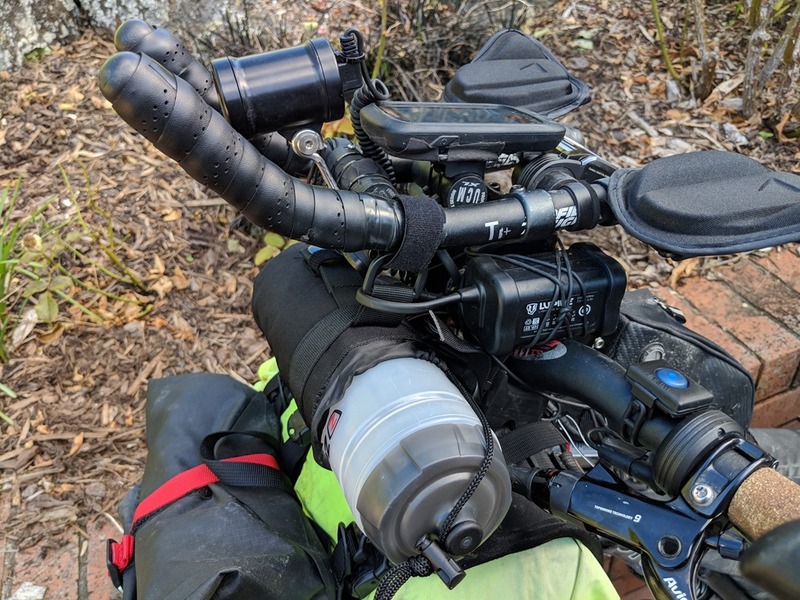 I have 3 x 1 litre Magnum water bottles on the bike which are the primary water supply. The seat is a new Specialized Power Pro Elaston. I only have a few hundred kilometres on it and I’m impressed. Hope I will not regret the change. My trusty ‘Thudbuster’ seat post takes out some of the bumps. Bike has new: XTR pedals (after 2015 TCR will never race with used pedals again! ), chain, cassette (40! ), Schwalbe Thunder Burt tyres with Stan’s race sealant. New batteries in my 4iiii power meter, heart rate monitor and the Garmin distance sensor (really useful when you lose satellite coverage in places like Big River). 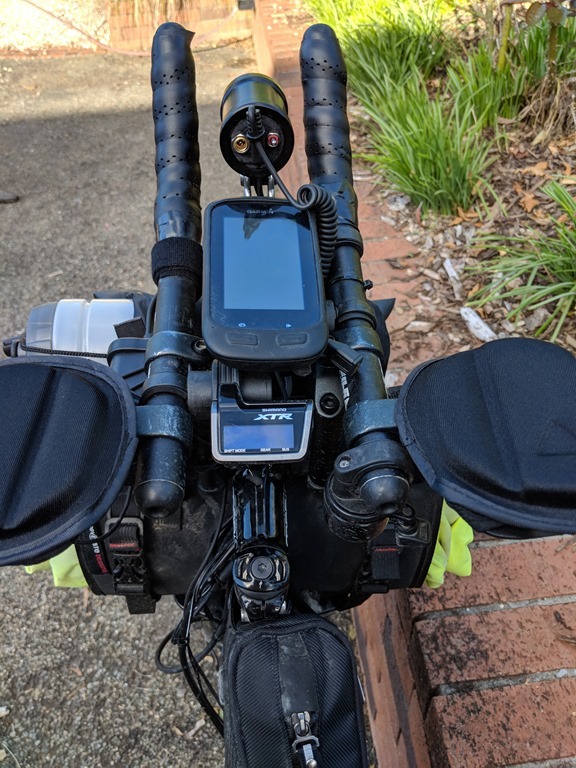 As a backup to my Garmin 1000 (in EVERY race I’ve done they have failed at least once on me), I have an old Xperia Z3 Compact phone which has ANT+ so will connect to the bike sensors. I’m running the app OSMand+ as the navigation app, and will use Ridewithgps app for collecting the data. 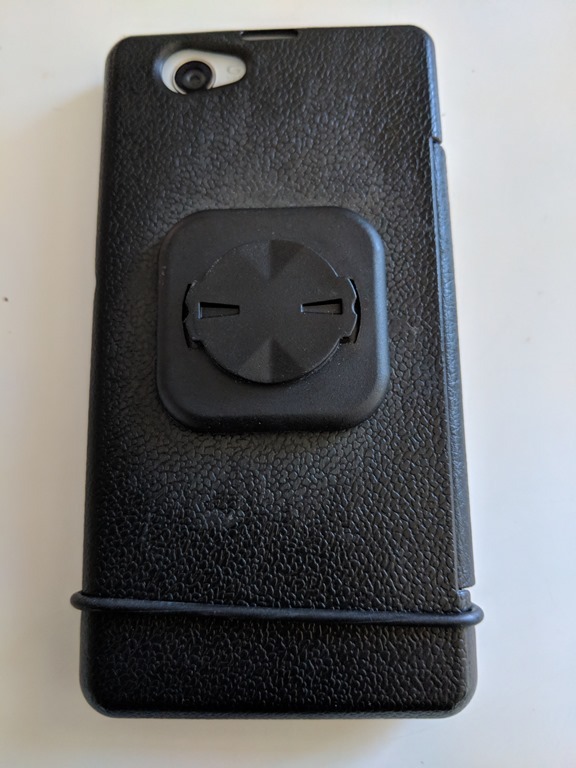 I got off ebay a Garmin compatible cell phone mount and put it on the back of the case, along with a Garmin rubber band to hold the case closed. Works great as the GPS will still receive. In terms of my gear, here is the complete list. Looking forward to the adventure! May the wind be at your back and the sun shine on your face. Enjoy! 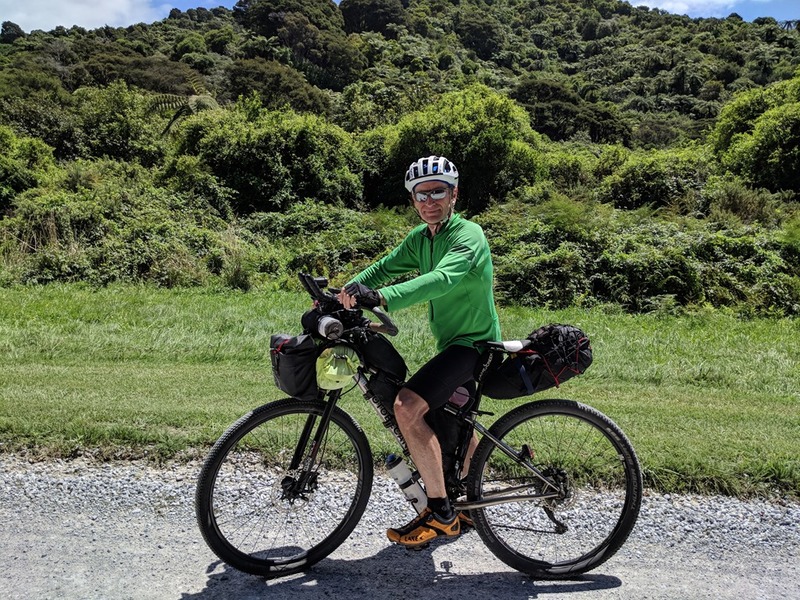 I wish you all the best for the big ride! I love reading your packing list because you’re the only one who’s more prepared than me. My highlight this time: Spare spokes and an emergency cassette removal tool, but then ALSO a FiberFix spoke – Awesome. After all, why wouldn’t you take a FiberFix since it’s so small. The cockpit setup is also pretty neat. Thanks for sharing.